Last December 2014, Smart Communications announces the first ever pay-with-mobile and best convenient way to pay apps and contents online for Android users or purchases at Google Play. This year, in fact recently, Smart announces another first ever pay-with-mobile innovation for service and mobile innovation for iOS users. The subscribers provided with great convenience of paying for apps, games, books, magazines, music, and movies on their Apple devices using only their prepaid load or charged on top of their monthly postpaid bill. “Pay-With-Mobile” is the newest service that you will not ever be using your credit card to purchase content and app in the App Store and iTunes instead it will directly use your Prepaid load or in Postpaid account, I know its all been waiting by iOS users in the Philippines to maximized the full potential of their Apple devices. Register by texting REG to 4949. After texting, they will receive their Pay-With-Mobile number and other pertinent account details. Once ready, users can go to the Apple ID Account Settings page on iTunes or the App Store, select “MasterCard” as their payment option, and enter the number and other details on their corresponding fields. 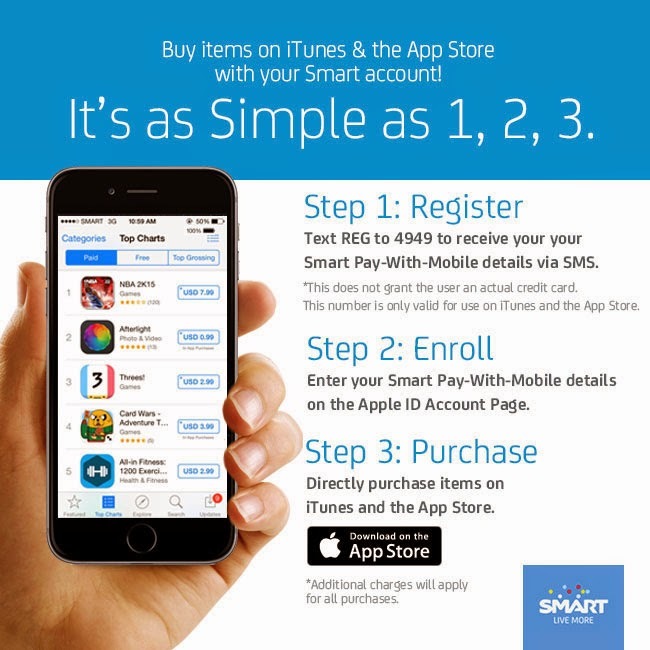 For more information and details for Smart’s Pay-With-Mobile service as well as the various things you can do with it, visit smart.com.ph/paywithmobile.